Fresh off his Australia & New Zealand Tour and August shows with Electro-Synthpop artist Miss FD, END: THE DJ continues this year's beat barrage on dance floors with the announcement of a club residency with RE:MISSION ENTERTAINMENT events and their signature monthly night, ASSIMILATION. Re:Mission Entertainment is based in the Midwestern & Southern U.S. For years, Re:Mission have brought many notable dark music artists to the region, from CombiChrist to VNV Nation, Assemblage 23 and many, many more. 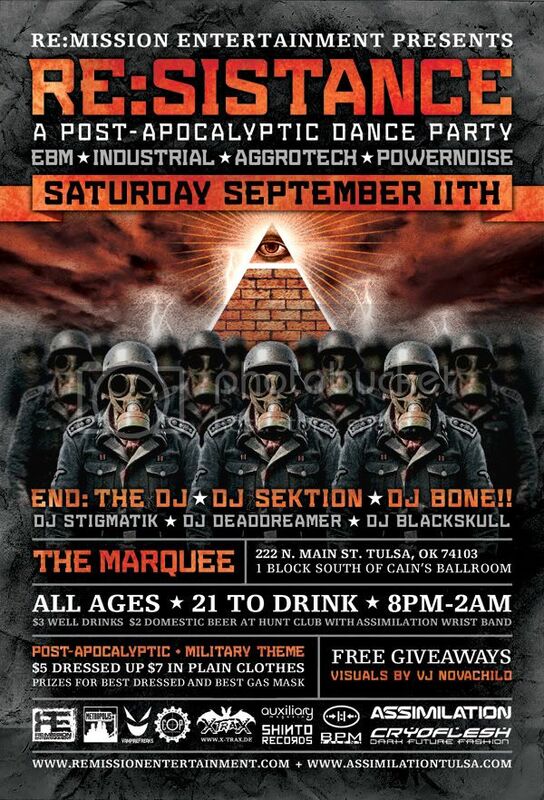 For over two years, they have been producing a monthly night, ASSIMILATION, in Tulsa, Oklahoma, with promotion and design by INDUSTRIARTS, the studio behind many of the world's Industrial music artists' album covers and designs. END: the DJ's residency with Re:Mission and ASSIMILATION is planned for the remainder of 2010. "I've played out at ASSIMILATION a few times the past couple years", End says, "and it's always been a great crowd, one of the best anywhere in the U.S. The crowd's tastes are very current and the DJs & staff there are amazing, very professional. I'm looking forward to being there more often!" End's residency kicks off September 11th with a post-apocalyptic dance event, RE:SISTANCE. Re:Mission Entertainment is also producing the ASSIMILATION DJ TOUR starting this Halloween going thru November featuring END: the DJ as well as DJ BONE!! of ASSIMILATION. This tour will give audiences in the U.S. the tone and musical atmosphere of an ASSIMILATION night live in different cities while also featuring End's upcoming benefit EP and double releases, all on Shinto Records. News of these releases will be announced very soon. END: the DJ's tours in 2010 are sponsored by Auxiliary Magazine, X Tra X Underground Wear and Cryoflesh among others.